These splendidly packaged discs arrived in the post some weeks ago and they seem to be the start of an important chamber music label headed by the charismatic and enterprising Marijke Miesson. The disc dedicated to French music contains an interesting cross section of works that include masterpieces by Marin Marais, that great giant of the Louis XIV age. 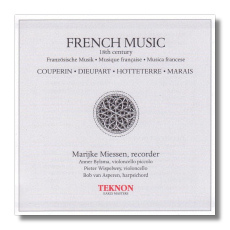 Couperin is also present and the music is always pleasant and extremely reflective especially in the solo recorder pieces. 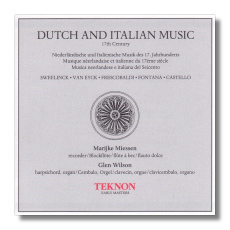 In the disc devoted to Dutch and Italian music there are a host of shorter pieces but the names of Van Eyck and Frescobaldi appear more frequently. Again, Miesson and her team of soloists play with fervour and charisma plumping new depths in these quite magical pieces by a host of composers.